A lot of people grew up on KFC Chicken. It was really one of the only fast Fried Chicken house’s around. My generation’s Moms were busy working or just getting wise about being stuck in the kitchen frying up a chicken.Warm biscuits and honey, corn on the cob and the creamy coleslaw. 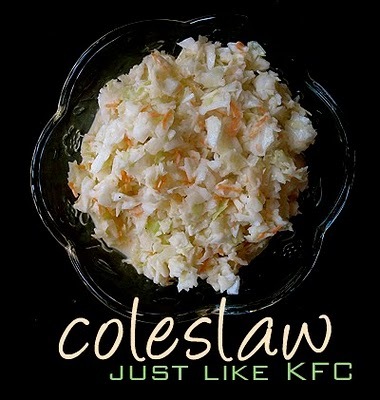 The Colonel always had the “Secret Recipe”, but as far as the coleslaw goes the secret is out. Chop cabbage into chunks and run through your food processor, or chop fine.